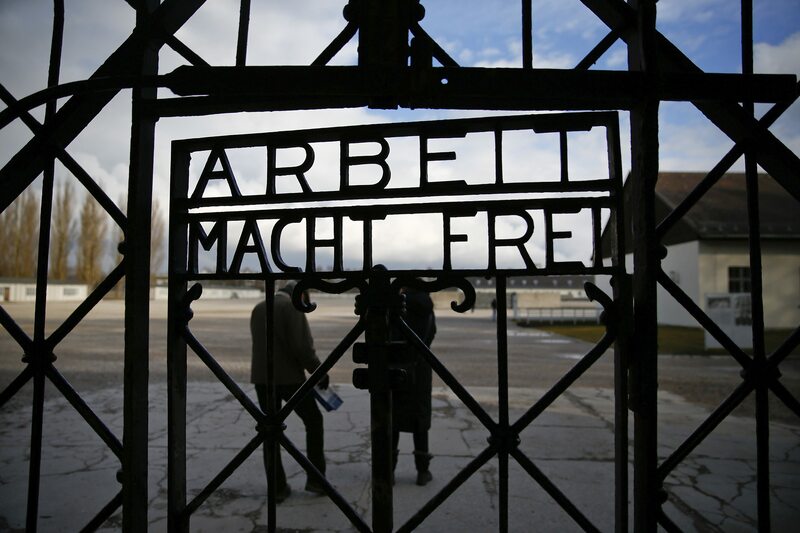 BERLIN -- A wrought-iron gate bearing the Nazis' cynical slogan "Arbeit macht frei," or "Work sets you free," has been stolen from the former Dachau concentration camp, police said Sunday. Security officials noticed early Sunday morning that the gate measuring 75 by 37 inches -- set into a larger iron gate -- was missing, police said in a statement. Whoever stole it during the night would have had to climb over another gate to reach it, they added. Police said they found nothing in the immediate vicinity of the camp and appealed for anyone who noticed any suspicious people or vehicles to come forward. Dachau, near Munich, was the first concentration camp set up by the Nazis in 1933. More than 200,000 people from across Europe were held there and over 40,000 prisoners died before it was liberated by U.S. forces on April 29, 1945. The camp is now a memorial. Memorial director Gabriele Hammermann condemned the theft of the gate, which she described as "the central symbol for the prisoners' ordeal," news agency dpa reported. She said a private security service supervises the site but officials had decided against surveillance of the former camp with video cameras because they didn't want to turn it into a "maximum-security unit." That decision may now have to be reviewed, she added. A blog posted by Israel's Yad Vashem Holocaust memorial wrote that "while we do not know who is behind the theft of the sign, the theft of such a symbolic object is an offensive attack on the memory of the Holocaust." In December 2009, the infamous "Arbeit macht frei" sign that spanned the main gate of the Auschwitz death camp, built by the Nazis in occupied Poland, was stolen. Police found it three days later cut into pieces in a forest on the other side of Poland. A Swedish man who had a neo-Nazi past was found guilty of instigating that theft and jailed in his homeland. Five Poles also were convicted of involvement and imprisoned.